Awesome God, Make Me Whole! There is a spiritual lesson in the making of a patchwork quilt. An early American pastime, the art of quilting used the imaginative designs crafted by women gathered in a quilting bee. Patchwork blocks made from fabric scraps and salvaged material accumulated from memorable events and treasured possessions are stitched and sewn into individual designs then aggregated into useful pieces. Colorful and oddly shaped fabric is cut, assembled and attached to create a complete work of art with three layers – the patchwork, the insulation and the backing – which is mended into a quilting masterpiece that is often passed down from generation to generation. When I think of God’s masterful work to make me whole I see my life as a patchwork quilt. Scraps and salvaged parts of a life well-lived but often hard-fought cut, paired, and mended together by the hands of a loving God. Each patch exemplifies my faith, my character and my capacity to love. Each layer is insulated by the Word and the strength of my salvation. God is my Potter, my Maker, my Restorer and my Redeemer. Through His craftsmanship He has turned this spoiled vessel into something new. And He has transformed the tattered pieces of my life and restored me into a purposeful and enduring believer. God has taken the jagged edges of my faith and cut away the doubt and uncertainty. He took the rough and uneven ends of my spirit and smooth away the unmanageable parts. God attacks the obscurity of sin that seeps into my mind and leaves me with the courage, through His salvation, to stay strong and to move forward with confidence. I am His work of art. Tattered, bruised and weak, I am made strong through the love of an omnipotent God. Even in my brokenness he can craft me into something whole. His Word insulates my life and reminds me that the real work to living out my destiny is done inside and not on the peripheral of my flesh. My backing, or my foundation, is God’s love – a sweet but firm fortress of strength that keeps me humble and strong. A Christian’s life is a work in progress. There is no day that passes that God isn’t cutting, pairing and mending our broken parts to make us whole again. He is the Creator of all things good. Resting in His arms guarantee us that we will be equipped and restored, beautifully packaged and secured through His love. Then I went down to the potter’s house, and there he was, making something on the wheel. But the vessel that he was making of clay was spoiled in the hand of the potter; so he remade it into another vessel, as it pleased the potter to make. But we have this treasure in earthen vessels, so that the surpassing greatness of the power will be of God and not from ourselves. But now, O LORD, You are our Father, We are the clay, and You our potter; And all of us are the work of Your hand. Michelle D. Jackson is author of The Heart of a Man, a Christian novel and Founder of The Charity Supper Club, a program designed to raise money to benefit local charities and families in need. This piece was printed in the March 2015 issue of The Mount Christian Lifestyle Magazine. 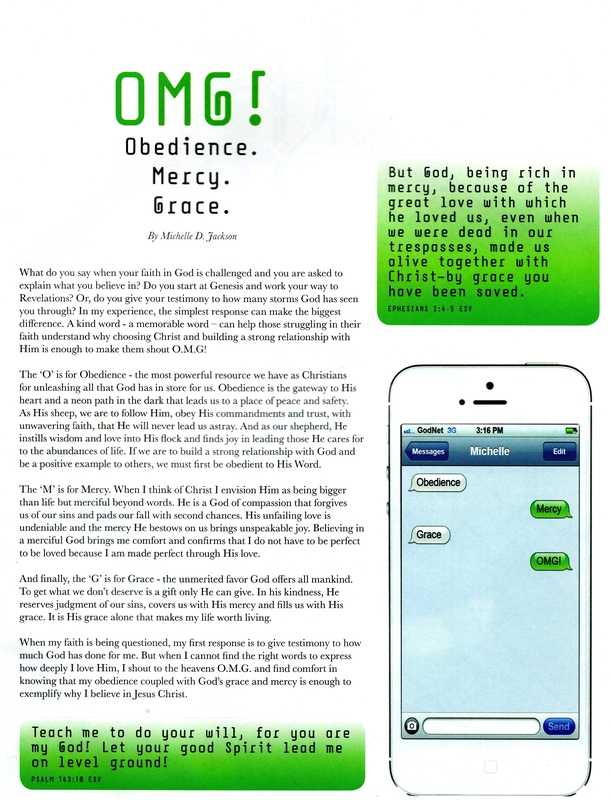 Check out my article in the Nov. Issue of The Mount Christian Magazine.